An Interview With Bodybuilding Great, WBBG Pro Mr. America Anibal Lopez. The life lessons Anibal has learned are well worth considering. In the following interview he outlines his experiences, how bodybuilding was back then, how he believes it is today and why. See how he continues to excel both physically & mentally. Becoming a bodybuilding legend requires several attributes and factors including the right mental attitude, training program and genetic base. The result of this combination is a well-structured body loaded with muscle and this is an obvious primary prerequisite for competitive success, often a natural consequence of owning such a physique. And should the competitor win often enough and make the right kind of impact over many years, they are almost guaranteed legend status and a large fan base. One man who did not become Mr. Olympia, or a multiple pro contest winner, or owner of one of the most massive physiques in bodybuilding, yet deserves a place among bodybuilding&apos;s elite on the basis of his dedicated efforts to being one of the best in the world and one who has achieved tremendous success despite initial physical shortcomings, is Puerto Rican competitor Anibal Lopez. 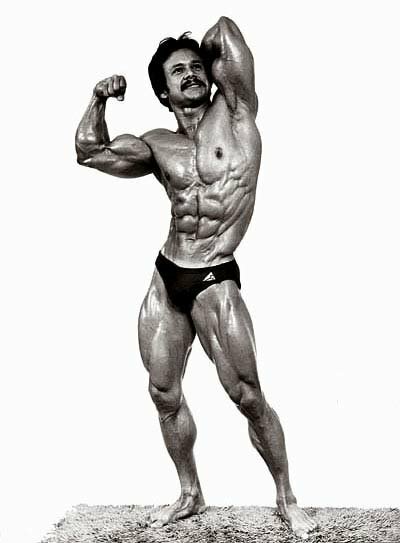 Having competed mostly in the &apos;60s and &apos;70s, beginning with his first contest, which was also his first win, the 1965 AAU Mr. Wagner, Anibal built his reputation on proportion and conditioning. Clearly he also had some good muscle size to make it to the professional ranks but at no more than 170 pounds contest shape, Anibal was no mass monster. And this suited him fine. Such was the affect his streamlined and attainable physique had on the wider bodybuilding public that no less than the great Steve Reeves was an Anibal Lopez fan. As a young man, and beginning bodybuilder, Anibal instantly realized he had the potential to grow fast. 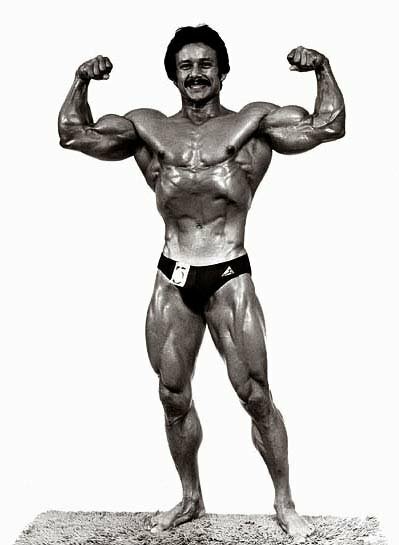 After buying a Weider weight training set, because it was advertised as being the best and therefore would give him faster results than other similar products, or so he thought, Anibal got to work building the body he would become famous for. 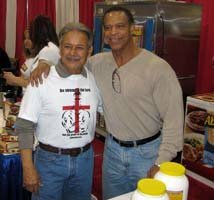 From New York, but now residing in Florida where he continues to train with great intensity at age 65, Anibal fell in love with the feeling bodybuilding gave him and the changes his body underwent as he grew from a skinny 135 pounds at age 16 to 160 pounds of solid, ripped muscle a short while later. 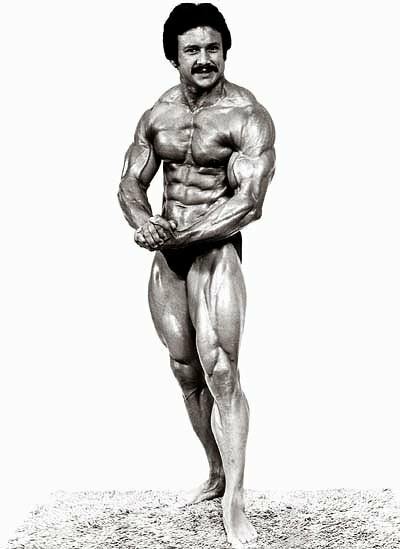 Not long after, he won a succession of East Coast bodybuilding contests, which culminated in 1978 WBBG Pro Mr. America and Pro Mr. World titles, his biggest bodybuilding achievements to date. In 1983 Anibal became disillusioned with the direction bodybuilding was taking and after competing for the last time at a 1983 IFBB Grand Prix event, dropped out of the sport and for 20 years completely lost interest in the pursuit to which he had dedicated the best part of his life. Bodybuilding no longer meant anything to Anibal. In the interim he took time out to find himself, and this meant a return to his roots. As a young man, Anibal was raised with Christian values imparted by his mother. Choosing to live a Christian life, however, was not to his liking and he devoted himself to sports. In his spare time he read bodybuilding magazines, not Bibles. Growing up in the Throgsneck Projects on Bronx New York&apos;s mean streets was not easy and money was extremely tight, but Anibal always felt loved. But upon leaving home and establishing various careers, including a stint in the Armed Forces serving in the US Army&apos;s 101st Airborne Division, and embarking on a singular quest to become one of the worlds best bodybuilders, Anibal, although very successful, and happy with what he had achieved in life, felt a degree of emptiness. 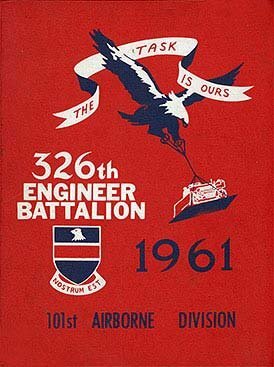 Anibal Was A Member Of The 101st US Airborne Division. After 20 years away from bodybuilding and having experienced several major setbacks, Anibal did not know where to turn. Then he reflected back on the Christian teachings his mother imparted. It all began to make sense. "And then I began to reminisce and look back on what my mother used to teach me, that you were supposed to believe in God and that God would always be with you and he was the only one who never leaves." Soon after, and retuning further to his roots, he began hitting the iron once again. Over the years Anibal has learned much about bodybuilding science and the mentality needed to become a champion. He has also had some very good teachers including inventor of the Nautilus range of weight training machines, Arthur Jones. Today Anibal enjoys passing on his bodybuilding, and Christian-based knowledge to others. He is also training with renewed passion and intensity and is in tremendous shape. The life lessons Anibal has learned are well worth considering. He is a man of wisdom and great insight. 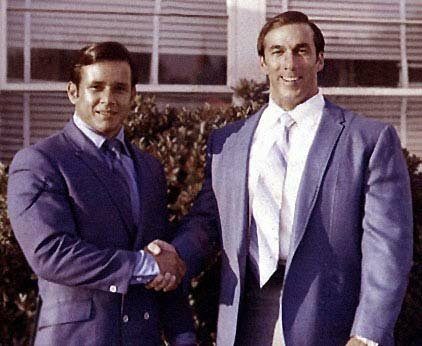 In the following interview he outlines his bodybuilding experiences, how bodybuilding was back then and how he believes it is today and why, in his later years, he is growing better than ever, both physically and spiritually. [ Q ] How did you first become interested in bodybuilding Anibal? I began to get interested in bodybuilding when I was very young. What really inspired me to become a bodybuilder was a guy called Raul Pacheco who was a very well known bodybuilder, a distant cousin of mine, and I lived near him and used to go and see him and his brother in law, Ray Jimenez, and they actually took me to see my first bodybuilding contest and I was really inspired by that. [ Q ] Was there a particular reason why you became involved in bodybuilding? I was always a small fellow and was kind of worried about my size. So from watching movies like Tarzan I saw these guys as being really strong and I thought I would like to be like that someday, so I began to exercise with weights and got into gymnastics. So those two things got me interested. I always leaned towards the bodybuilding part of it. I did it more just to increase my body size. [ Q ] At what point in your life did you know you had the potential to become a bodybuilding competitor? I noticed my body responded pretty well to bodybuilding and weight training and I just continued to do that. My body just naturally responds to exercise versus other people who may exercise but do not get the same results. So after I saw how my body responded I said, "Okay, maybe I can become one of those bodybuilders in the magazines. Maybe I can compete someday." 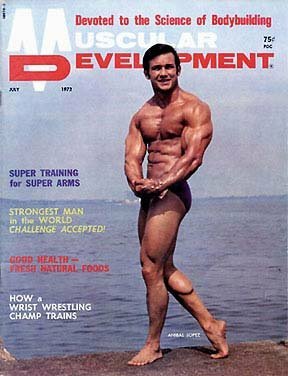 & Muscular Development, July 1972. [ Q ] Did you like the process of getting in shape and was that also a motivating factor for you? I always looked forward to going to and doing exercise. It just felt good to me; it felt natural. I have always enjoyed it and I still do. As a matter of fact I just worked out today and I still train very hard. [ Q ] You mentioned that as a child you were naturally athletic. What other sports were you involved in? I was also interested in boxing and I liked doing that. The other sport I really enjoyed was gymnastics. [ Q ] How did gymnastics help your bodybuilding training? Were there any positive flow-on effects to doing gymnastics? I think it helped in the sense that I was able to increase my strength and I also learned from gymnastics, something that I also employ in weight training, and that is you don&apos;t need to do a lot of heavy exercises so long as you do more in the way of intensity. I always give the example of gymnasts who have great abdominal development. And they don&apos;t do that many sit-ups and things like that. Some of the best abs I have seen are on gymnasts. I always think the intensity is more important than doing a lot of heavy training. Has anyone tried these? A guy I work with has been getting into crossfit training and just bought a set of rings. On Tuesday I went down to the gym in our office building and did a "short" workout with him: we did 10-12 ring pushups followed by 5-6 pullups (on a fixed bar) and repeated that for 6 sets. We each rested while the other was doing their set. We were done in about 20 minutes. [ Q ] Some gymnasts do have amazing muscular development yet their training is volume oriented and they tend to train their endurance capacities rather than utilizing pure, heavy power movements. Yes. I used to see these guys who had amazing shoulder and backs and all they did was pull-ups on the rings and the high bar. And these guys never lifted weights. I had a brother who was a gymnast and he had an amazing upper body. [ Q ] I understand you did most of your training on the East Coast. As far as you can tell, is there a different training mentality between those who train on the East Coast and the West Coast? I personally don&apos;t feel that there is any difference. I think we all did the same things. It all has to do with your genes. If you have the right genes and the right body it doesn&apos;t matter where you train; you are going to respond well and develop. I don&apos;t really think that there are any differences between the West and East Coast athletes. Actually, many guys on the West coast came from New York. It just happened that a lot of guys liked the atmosphere in California, but as far as it making a difference in their physique I personally don&apos;t think there is any difference. [ Q ] When you began bodybuilding what was your beginning bodyweight and what did you ultimately achieve? If you look at my pictures when I was at my best I never weighed more than 160 pounds. I began with a bodyweight of around 135 pounds at 15 or 16. My bone structure is not large and I never carried a lot of weight but I was always very muscular. [ Q ] What was your training philosophy? I never really handled a lot of weight and always worked within my limits. To develop a lot of muscle I don&apos;t believe you need to handle a lot of weight because if that were the case you would see a lot of weightlifters with massive muscles. A lot of them though are very fat because that is the type of physique they have. I really believe that working the muscle hard is the answer for bodybuilding — it is not how much weight you handle. But the weight lifted has to be lifted according to your natural strength. In other words I always trained with guys like Chris Dickerson and Steve Michalik and these guys were a lot bigger than me, they outweighed me by a lot. But if you are strong, like these guys, of course you are going to handle more weight but if you don&apos;t have the strength and the size you can still develop a great body. [ Click here to learn more. ] An Interview With Chris Dickerson. Chris made history becoming the first African American to win the A.A.U. Mr. America. Chris recently gave me a glimpse into the life of one of bodybuildings greatest. [ Q ] Would you consider nutrition to be as important as training or more so? Absolutely. I am a great believer in nutrition and I am a great believer in using supplements. I am also a believer in not abusing supplements. A lot of people think that because they take a certain protein powder that it will make a big difference in their body and I really don&apos;t believe that. They (supplements) help and I think that you should take them. As soon as you become involved in bodybuilding you are no longer a normal person because you are placing a stress on your body that is not normal so I believe that you should be supplementing. Also you would have to eat a lot of food to get the same amount of protein and nutrition out of this than you would out of a eight ounce glass of good protein drink. You have to consume a lot of food. This is why all of these things come into play. I think it is better to have a protein drink than to skip a meal. When you are working out hard you constantly have to put the nutrition into your body, there is no question about that. [ Click here to learn more. ] Protein - The Foundation Of Building Muscle! Protein is made up of amino acids which are the building blocks of muscle. I&apos;ve put together details about the basic forms of protein and how they are important. [ Q ] Describe the kind of bodybuilding equipment you used back when you began training and how does it compare to the machinery that is used today? No comparison. Everything nowadays is very high tech and it is made for people who want to work out. When I began training all I had was a bench, a pair of dumbbells and a barbell. There were no machines. Anibal Training With Chris Dickerson. [ Q ] Of course many people would say that free weights are all you really need to develop muscle. Do you agree with this sentiment? I do think machines have a place in bodybuilding and weight training. But I still think you should combine (free weights and machines) and you should not depend solely on the machines for the simple fact that machines do not require a lot of coordination to balance a weight like barbells do. With barbells and dumbbells, other muscles will come into play when you do that. I have seen people do a bench press on the Smith machine and then they go and do the same movement with free weights (with the same weight) and they can&apos;t do the free weights. Because it takes extra muscle to balance that weight and to push it up and down. Do You Prefer Free-Weights Or Machines? [ Q ] Do you think that machines can also be good for rehabbing injuries? Right now I am working out on machines that were invented by Arthur Jones, the Nautilus machines, and other similar machines that were invented later on and they are great. The good thing about these machines is they lower the chance of getting hurt compared to free weights. [ Q ] What are some of main differences between using the Nautilus machines and some of the newer ones available today? Well I have been out of bodybuilding for quite a few years and for the last couple of years I have been getting back into it. At the present time I am working out at this facility at a company called MedX and they make these great machines. The workouts I am doing now are a lot less compared to when I was training with conventional equipment and weights. The other thing is I had already had both of my rotator cuffs operated on and using these machines has helped me a lot and I have been able to work on my shoulder a lot better compared to using free weights and I am getting a great response out of it. [ Click here to learn more. ] Don&apos;t Let A Rotator Cuff Injury Stop You! Rotator cuff injuries are probably one of the most frequent injuries experienced by athletes and non-athletes... Shoulder hurt? Don&apos;t put this off. As far as working out, in my experience the machines I am using now have made great changes and there is no comparison compared to how I used to train. These new machines actually encourage people to train. [ Q ] How has your training evolved over the years? If I had to do it all over again I probably would not train as long. I would concentrate on my movements and go a little slower when executing my exercises. I believe you should train as hard as you can in the shortest time possible. I will not train is long and I don&apos;t think it is necessary to train six days a week. But that&apos;s me. [ Q ] So you have packed on more size and gotten more refined using this less is more approach? Absolutely. I think bodybuilders really waste a lot of time in the gym. I have been to gyms and I see people just talking and talking. When I have done half of my body they are still working on one body part. I believe they waste a lot of time because they don&apos;t train properly. If you train the muscle properly it does not take much time, if you work it hard and short and then let it rest. [ Q ] There is also the school of thought that if you shorten the rest periods between sets you can cram more intensity into each workout and shorten the time it takes to complete each session, therefore giving you more bang for your buck. I believe why should you do six sets of barbell curls when you can achieve the same thing by doing two sets if you do those sets to their max. I also believe that the muscle only knows hard work and that is what it responds to. So if you do mediocre sets you will have to do a lot of sets, but if you do hard sets and you make the muscle work not only will you grow but you will get stronger too. I don&apos;t think the muscle can tell the difference between 100 pounds and 50 pounds. You could do 20 repetitions with 50 pounds or ten repetitions with 100 pounds to failure, but only the one you take to failure will work for you. [ Q ] You are saying that it doesn&apos;t matter if you use a light or a heavy weight? The weight comes into play depending on your natural strength. Let&apos;s just say for instance you and I are working out and you just happen to be a strong guy, well of course I might be able to only do 100 pounds and you might handle 200 pounds but we will still get the same results. What people don&apos;t understand is that you cannot duplicate other people&apos;s strength. So my muscle will grow using 100 pounds just as well as your muscle will grow using 200 pounds. Verses if you tried to use just my 100 pounds then you would have to do more repetitions than you would when you are using 200 pounds. "You Cannot Duplicate Other People&apos;s Strength." [ Q ] You have to work within your own personal parameters. Yes. This is why so many people get hurt weight training. Because they try to duplicate the other person&apos;s workout — after a while you need to learn what your body requires and what it can handle. I see a lot of my friends today, old time bodybuilders, who have all kinds of problems. You have to be very careful; that&apos;s why people get hurt all the time (because they don&apos;t work within their personal parameters). [ Q ] To truly overload the body and grow do you occasionally do lower reps to achieve the different stimulus they provide? There is a thought that to grow you need to work with fewer sets on the mass building movements with heavy weights to tax the body systemically, to cause a greater growth hormone release. I think if you work the muscle hard and you make it work hard you will acquire what you are asking me. I&apos;m not saying that you should use light weight, what I&apos;m saying is you need to achieve what you are trying to do any way you can. Also what comes into play is your diet. What you eat has a lot to do with it too. Because you could do thousands of repetitions for abs but if you continue to eat all this crazy fattening food and sugar then forget it, it is not going to work. 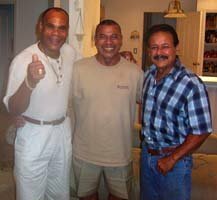 Anibal With Shawn Ray And Bobby Barker. [ Q ] What is your exact training program? I am presently training the whole body every workout for thirty minutes, implementing the Arthur Jones system using the MedX machines with a three-day rest in-between. I do two exercises for each body part, one set of each to momentary muscular failure. One set equals three or four sets done in the conventional fashion. I concentrate on the large muscles to increase size and strength (I am getting great results at age 65; I never thought I would be able to train with such intensity again). I do ten exercises for the whole body, beginning with four exercises for the legs and one set each for calves, then back, chest, shoulders, biceps and triceps — before each of these non-leg sets I do one warm-up set, giving me two sets per body part. When I finish the last exercise I feel like my body is in a state of shock and there is no possible way I could do any more; I do need three days to recuperate. The idea is to shorten the workout, increase the weight and still do the same number of repetitions each time. This type of training is bringing my body back to where it was during my competition days without spending as many hours and days in the gym. All exercises are done for eight to twelve repetitions and I force two more to momentary (muscular) failure at the end of each set. All exercises are performed on MedX exercise machines. Leg curl (Lying on stomach). Leg press (form of squat but resting on your back, pushing away from the body). Standing calf-raise (20 to 25 reps to momentary failure). Reverse grip pull down (biceps and back). Chest press machine: seated (chest and triceps). Seated side lateral machine (shoulders). Curling machine, like preacher curl (biceps). Dips on machine (chest and triceps). -Time to complete routine 25 to 30 minutes. 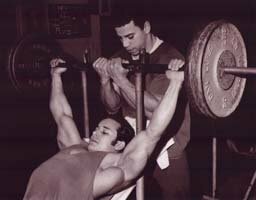 Anibal trains with Jim Flanagan, who himself began training in 1971 with Arthur Jones, the inventor of the Nautilus range of exercise equipment. Today, at age 61 years and at a height of 6&apos;5" Jim weights a solid 275 pounds. Jim is Vice President of sales for MedX equipment and is using the knowledge he acquired from Arthur Jones to help Anibal get back in to great shape at age 65. "Anibal at age 65 years young is training at the show room I have set up in my home. Currently Anibal is training every 72 to 96 hours, averaging two workouts per week. Each routine is a total body workout, starting with the largest muscles down to the arms. "Phase one consists of nine exercises and the total is completed within 35 minutes. "In each workout Anibal must increase the reps or the resistance, or both. This is double-progressive weight training. He never substitutes more weight for poor form. Each exercise is performed in strict fashion. "The key is the &apos;Intensity and effort&apos;." Momentary Muscular Failure is a concept coined by Arthur Jones that explains the relationship between intensity of weight training effort and the production of power. Jones felt that intensity was related neither to the amount of work nor the production of power, but, rather, is a relative term that is directly related to "the percentage of momentary ability that you are actually using," (Darden, 1982 p. 49). Arthur Jones believed that the fastest possible strengths gains could only be derived through 100 percent intensity of effort. My diet consists of good wholesome foods; I stay away from sugary and processed products. I enjoy green vegetables, rice, some eggs, and fresh fruits. I do not eat red meat or pork, I eat some chicken and turkey (not too much) and I do enjoy fish very much, such as tilapia, red snapper and plenty of fresh salmon. For breakfast I usually eat whole oatmeal and I add Hemp protein powder, raisins and cinnamon powder. I also have a multivitamin , a tablespoon of Hemp Oil and one capsule of Co Q-10 (100mg.). After every workout I take a protein drink of Naturally Juic&apos;d .
(he has this any time of the day and often for breakfast). Add either a peace of tilapia fish or a peace of fresh salmon (or, alternatively, add four tablespoons of hemp protein. [ Q ] What did you enjoy most about getting onstage and competing? Well getting to that point in my life to where I could get onstage and stand in front of a crowd and pose, to me it was a great accomplishment because I never thought I would be able to do something like that. The other thing is that I never saw myself as a legend or a great bodybuilder. I know I am a bodybuilder and I know people try to put me in that category (legend) but I personally don&apos;t see myself like that. I admire a lot of other bodybuilders and I truly enjoy posing. [ Q ] And what would be the highlight of your bodybuilding career? The highlight of my career was being able to win all of those big titles and to be here to tell you about it. [ Q ] you are talking about your WBBG Pro Mr. America and Mr. World titles? [ Q ] Give me some background on your professional bodybuilding career. You won the Pro Mr. America and Mr. World in 1978. What other pro shows did you do? I competed at the Night of Champions twice and went on the Grand Prix tour and competed in two of these shows. [ Q ] What was the main difference for you in competing as an amateur versus competing as a pro? When I began competing I began with the AAU and the difference to me was in the competition. You were judged differently. I really enjoyed my amateur years with the AAU then as a professional it was better because I was able to make some money out of it. With Chris Dickerson At The 1970 AAU Mr. America, Which Chris Won. [ Q ] In what ventures did you make money as a professional? I had the opportunity to do some exhibitions and sell pictures and T-shirts and things like that. But I never got rich out of that (laughs). [ Q ] Many bodybuilders from back in the &apos;70s talk of having to balance their bodybuilding career with a regular job. How did you survive as a bodybuilder? I always had a regular job and I managed to raise a family and I also did some work on the side with building equipment and I also had a health food store for a few years. So I used the recognition I got out of bodybuilding to get through. [ Q ] What was your regular job? I am retired right now but I worked for the New York Transport Authority with the bus department. [ Q ] It must have been incredibly tough balancing your job and family with your bodybuilding commitments. To be able to do this you really have to love the sport. To me bodybuilding was always there and I just dedicated the time. If I had to get up at five o&apos;clock in the morning to work out before I went to work then that is what I would do. And you have to dedicate your time to it and be consistent if you want to succeed. I was able to raise my family and I competed and kept a regular job. When I was here last week with the guys (on August 24: Anibal&apos;s birthday) we were talking about Arthur Jones and he always used to tell me, "You know Anibal, I really have a lot of respect for you. I admire you because you train hard, have a good body to compete and have a regular job and a family so I have a lot of respect for you." And that is something Arthur Jones would not tell anybody. Coming from him that meant a lot. He wasn&apos;t the kind of man to be giving out compliments (laughs). [ Q ] What exactly was your association with Arthur Jones? Not a lot initially. The only times we got together was when he began developing the Nautilus machines and he used to bring them to shows like the Night of Champions and also to the Grand Prix events. But we became good friends. [ Q ] Everyone who knew Arthur seems to have an Arthur Jones story and I assume you are no exception. One time we were in Louisiana for one of the Grand Prix competitions and he had his Nautilus machines backstage for us to warm up on. He was standing to the side and he began to read something from a piece of paper he had in his hand so he pulled out his glasses and put them on to read the paper. So I was watching him and felt pretty comfortable talking to him so I walked over and said: "Arthur, one thing I don&apos;t understand about you." He said, "What is it Anibal." I said, "Here you are, a man who has invented a lot of machines and who has done a lot of great things and yet you have to put on these glasses to read. Could you not do something about that?" So he said to me, "Anibal Lopez, I am going to tell you something. I may have to put these glasses on to read this paper, but if I stand you..." and here he pointed to a building that was pretty far away "... way over there by that building I bet you that without my glasses on I could pick you off with one shot of my .45." I said, "Okay you win (laughs)." That is the kind of man he was. There was nothing your couldn&apos;t tell that man that he didn&apos;t have an answer for. [ Q ] I understand he was very knowledgeable on many different subjects as well. Absolutely. He was very straight and he knew what he was talking about. The place where I am working out at now is run by a guy called Jim Flanagan who was with Arthur Jones right from the beginning for over 30 years and he is just like Arthur Jones. He has every machine at his house. He is a representative for MedX — and that is where I have been doing my training as I mentioned before. He is working with me and we are seeing what we can do. We are doing a lot less training, but it is very, very hard. I am slowly beginning to adjust to it again and am feeling really good about it. [ Q ] What kind of shape are you in these days? My body is responding very well to this training, which I am surprised by. I&apos;m trying to adapt to this Arthur Jones type of training and am working very hard. Right now the most we have done for the whole body is ten exercises, which takes between 25 and 30 minutes and I&apos;m wiped out. What we do is one workout very hard then we take three days off, and then we go back again. I trained today, which was even shorter. The other thing Jim likes to do, which was Arthur&apos;s idea, also is to constantly change the exercises. We do not do the same routine all the time. So I am really enjoying it and my body is kicking in again. We are going to see what happens. [ Q ] How would you class your current method of training? Is it similar to High Intensity Training (HIT) popularized by Arthur Jones? It is something similar to that (HIT), something similar to what Mike Mentzer did. It is very, very hard - especially at my age (laughs). [ Q ] As an older trainer what are some of the things you do to compensate for the rigours of training? Right now I need to rest more in between training sessions. I am also very concerned about my health and I always put my health first, versus my body. I am looking forward to the next few months to see what kinds of results I get from this training. I haven&apos;t done this kind of training for many years and I&apos;m very excited about this training. I&apos;m leaving the free weights alone a little bit and will see what comes out of this. But so far my body is responding very well to it. The recovery time is longer because of the intensity of the workout. 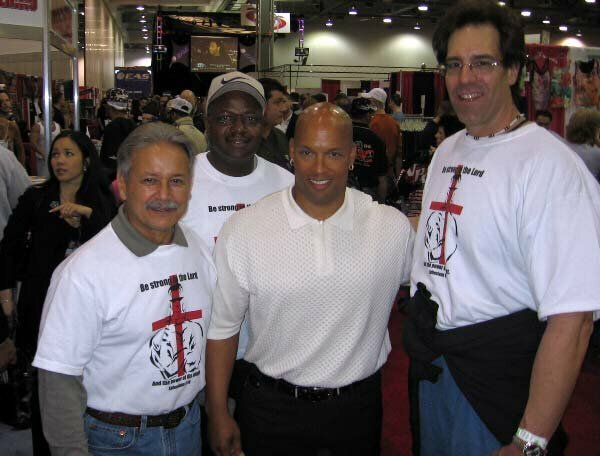 [ Q ] I understand you are a good friend of 1982 Mr. Olympia winner Chris Dickerson. How did you two meet and become friends? Chris has played a very big part in my bodybuilding career. He has helped me a lot and taught me a lot in my early years and we became friends and training partners. A lot of people think I am a good poser but I owe it to Chris. He taught me how to pose and made me pose a lot. He is like part of my family and we always stay in touch. 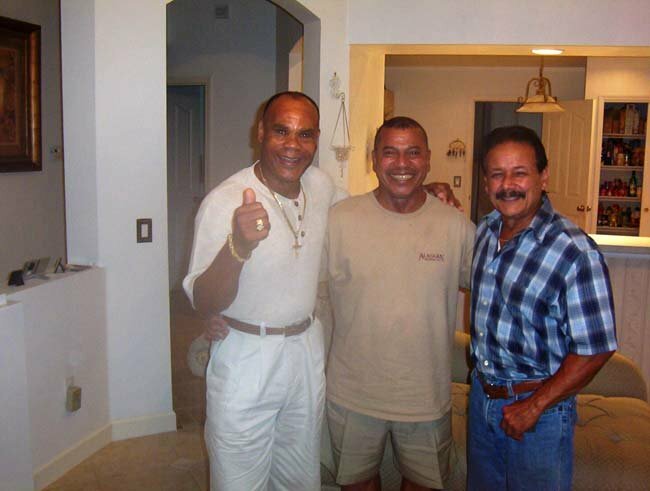 Anibal With Chris Dickerson & Warren Frederick. [ Q ] Did Chris influence you in respects other than posing? Oh yes. He always told me that I should keep a good image in bodybuilding and that I should always present myself well wherever I go — clean cut. 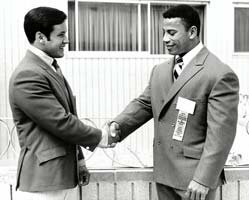 Chris Dickerson is a clean cut guy and he always told me that we should conduct ourselves properly so people will look forward to seeing you once you become known. And he always advised me properly in training and always took the time to answer my questions and help me whenever I needed it. And we are still good friends. [ Q ] I understand you also used to train with WBBG great, Warren Frederick. I knew Warren back when he was competing and at times we trained in the same gym in the Bronx. I never had a close relationship with him but we knew each other. I think he is a nice person but then there are not too many people I have a problem with. As a competitor he held his own always looked big and very muscular, but I never competed against him. 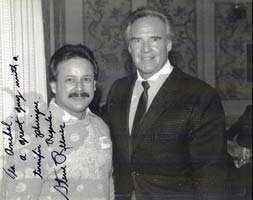 I lost track of him for many years and this year we made contact here in Florida over the telephone. We then met in person at the WBBG (2007) induction. Since then he visited my home and had a wonderful time and we have been in touch since then. Throgsneck Community Center, Bronx New York. Anibal And Chris Would Devote Their Time To Helping The Center. [ Q ] You have had associations with many champion bodybuilders over the years. As far as you can tell what are some of the essential qualities that a top champion possesses. What commonalities do they have? I always tell people that everybody can exercise with weights but not everybody can be a champion. You need to have those genes, the bone structure, and the balance to be able to do this. You have to have that drive and it has to become part of your daily life. To become successful not only just in bodybuilding but in any sport you have to live and eat the sport. It has to be part of your life: you can&apos;t just do it one week or one month and then stay away for two months. It is a process and the secret to it is to be consistent. [ Q ] You have shown that one can balance a whole range of objectives, but is it possible for the average person to balance a career as a bodybuilder without sacrificing in other areas? Everybody is an individual so it would be difficult for me to tell someone to do what I did; we are all different and we all have our own personality but if I had to advise someone who wanted to be a bodybuilder and they are looking at me as an example, I have to tell them it is not going to be easy especially when you are married. You need a special woman to keep up with you and put up with a lot of things (laughs) and all the changes that we go through. It hasn&apos;t been easy. I&apos;m in my second marriage. With my first marriage my wife was a wonderful lady and all and she protected me and helped me out with my bodybuilding. It became a problem when I began spending more and more time with the bodybuilding. So there is a price to be paid also. I want people to be careful in how they make their decisions. Being involved in the sport is a big sacrifice and requires much dedication. [ Q ] As you have become more experienced you have gained an ability to put life more into perspective? Exactly. I have learned that everything in life, all the material things pass and that as we get older we need to have a balanced mind and not just look at the present but look to the future also. And that&apos;s one thing I always did, I said, "One day I&apos;m not going to be able to look like this. I&apos;m not going to be able to keep my youth." So as you go along you make adjustments. I haven&apos;t been perfect and I have had my ups and downs with my personal life. [ Q ] So what did you come to realize was most important in life? Now I was able to understand what life was really about. It is not all about your personal gains and yourself. I think too many bodybuilders become self-centered. They only think about themselves and not about anybody else. That is why some of them commit suicide, why some of them die or end up in jail. They go into this ego trip and forget about everybody else and you can&apos;t do that. You have to consider other people too. [ Q ] So having a strong faith serving a stabilizing influence in your life is an important way for you to do this? Absolutely, you have to have somebody to influence your life. This is why I try to conduct myself in good manner when I am around other people and I try to raise my children in the same way with strong values. That is very important. [ Q ] Can you give me some background on how you devoted your life to God and how and why today you use you religious faith to help inspire others? My mother was a Christian all her life and this is what I was taught. But I would never practice it; I would just walk away from it and wanted to do nothing with it. Then at age 50 something happened in my life and all those teachings started coming back to me. All My Accomplishments Would Not Have Been Possible"). Although I was successful and bodybuilding already and was known, I had a problem and I didn&apos;t feel happy, I felt that something was missing in my life. Well my life became a mess after a while; I lost my first marriage and did not know which way to turn anymore. And then I began to reminisce and look back on what my mother used to teach me, that you were supposed to believe in God and that God would always be with you and he was the only one who never leaves; the only one who could comfort you and change your life. So then I began to think about that and then one day decided - upon moving to Florida - to visit a church here and ever since I did that I began to learn what it is to have a relationship with God and as I began to do that my life began to change and I became a happy person again. I would like to tell you that I actually stepped away from bodybuilding for about 20 years until now. This is the first interview that I have actually done in over 20 years and it all happened because of my website and so many people have responded to it. So many people have been touched by my testimony and by the change in my life. I now know the Lord wants me back into this (bodybuilding) now so now I use bodybuilding as a tool to reach other people. Not necessarily to make a religious person out of anybody but to make people aware that there is something else in this world that can make you continue on. And it will bring you happiness. So now I am back working out again after so many years of not doing anything with bodybuilding. I feel very healthy and feel very blessed to be able to work out with this intensity. When Chris (Dickerson) was staying with me a week ago he trained with me and he was amazed. As a matter of fact, he joked and said, "Do you know what, I think you are going to be able to compete in the Masters Olympia." So if I have an opportunity to use bodybuilding to talk to people who may be in the same position as I am, that is what I will do. We all have different callings. [ Q ] Very well said. What was your last contest before you walked away from bodybuilding competition? My last competition a Grand Prix contest in 1983; I never did anything else after that. I really couldn&apos;t continue, I didn&apos;t know what it was. I couldn&apos;t compete against those guys as they outweighed me by a lot; they were a lot bigger. And another thing is, I refused to get into the use of steroids. I had a choice: get into the use of steroids or walk away healthy. [ Q ] To compete on the pro scene you must have used steroids at some point. I would like to clarify one thing before I talk on this subject and I try not to concentrate too much on it, as I am not an expert on the subject. When I began to enter the professional ranks I was encouraged by some of the bodybuilders to use steroids and I tried a couple of things here and there and I noticed that it was not for me. After I did that I began to investigate and do some research into the outcomes of using steroids. Like I said before, I have always been conscious of my health and have always tried to take care of myself and live a healthy life. When I began to see a lot of the things that happened to different guys I said, "Well, this is not for me. I want to be around for a lot of years and I want to be healthy in my later years." So I figured that if this is what it took to do this then I might just as well leave it alone. And I walked away from it. It is crazy. I just don&apos;t understand this. I say it a lot of times: we are supposed to be doing this for our health but yet we are so self-destructive. We aren&apos;t talking just about anabolic steroids; there is a lot of other stuff out there. My point is that people, and this applies to sports people in general, need to accept that not everybody is born to be a champion, not everybody is born to be Mr. Olympia or a Mr. Universe or a great baseball or basketball player, or football player. I go back to what I said before: it all has to do with genetics. Some of us are blessed with a body that&apos;s going to respond to whatever the sport is. So my example is this and I always say it and live by it, and if bodybuilders try to learn this they will not use drugs and harm themselves: a good small man cannot beat a good big man so be happy with what you can accomplish within your limits. I believe that what the bible says: that the Lord gave all of us different levels of understanding. This is why we cannot all be doctors. It is why we cannot all be a Mr. America winner. I accept that it was hard to beat guys who outweighed me by 40 or 50 pounds that were really good. But I did beat guys who outweighed by that weight but they were not that good by comparison to my physique. My point is that we could all be champions within our own limits. We all have limitations but man cannot accept that. A bodybuilder, a smaller guy, sees a big guy with a great physique and want to be like that. So what do they do? They want to look like this guy so they start taking these drugs to try to get to this level. And guess what? They still can&apos;t beat him. Why? Because it doesn&apos;t work that way! So we wind up hurting ourselves. So if there were no steroids, or any of these types of drugs, there will always be a Mr. America, a Mr. Universe, and a Mr. Olympia. You earned it because you deserved it. I don&apos;t think steroids make champions. I think of, for instance, Arnold Schwarzenegger. Arnold was always a big man and whether he used steroids or not he was always going to be good. And a guy that was smaller than him might have used steroids but they would not have had the genetics, the bone structure and size. They didn&apos;t have the body that responded to it (drugs). That is what is happening in baseball now - we are seeing the same thing. This guy wants to hit harder than the other guy so he goes into this stuff. You don&apos;t need that. You either have it or you don&apos;t. Be happy with what God has given you. Anibal And Bill Grant Onstage Back In The Day. [ Q ] But what if you have two guys of equal development and with equal genetic potential, and one decides to use steroids? Then would you not have an unequal playing field and a situation where both must use steroids to remain competitive? Of course because the person taking them is going to have their body respond better compared to the one who is not using the steroids. But what I am saying is there is no need for it at all if you want to be fair about it: let the best man win. Train harder. I always believe that if the two guys are both equal in height and size then the guy who is training harder is going to win. That&apos;s what is supposed to make you win, the effort you put into the sport, your dedication. [ Q ] In a perfect world this scenario would be true but the way things have progressed the drug culture has become firmly entrenched to the point where all professional bodybuilding competitors are using steroids and it is just a fact of life. It comes with the territory. What would you say to this? And this is why bodybuilding, if it continues like this, is never going to get the recognition that it should. You see, years ago the average person out there didn&apos;t know anything about steroids. Now the average person knows about steroids because it is all over the news and now everybody knows about them. And it is getting a bad rap and that is why not too many big companies are lining up to endorse pro bodybuilding athletes. If this were the case all of those guys who won Mr. America and Mr. Universe or Mr. Olympia would be all over the TV stations endorsing all kinds of products like the basketball players and many other people do. You don&apos;t see that. We have destroyed the sport itself when it could have been so great. I believe that we could have had the same recognition (as other sports) but we have destroyed it ourselves. I really think this thing with steroids came out of using supplements. Supplements are good because you cannot nourish your body naturally when you put it under so much stress. But people came out with this idea of steroids. It all began with a little blue pill. Look what it has come to now. [ Q ] And you did experiment with steroids at one point? [ Q ] It is thought steroids are addictive in that the feelings of power and confidence they can provide is missed when a user goes off their cycle. Was this true in your experience? Oh yeah. I have seen it happen to a lot of guys. I didn&apos;t get into it that much for it to have that kind of an effect but I have seen it with many, many bodybuilders. The problem here is that you are putting something into your body that is not natural. So what you are doing is making your body stop producing testosterone. So there comes a time when you have to stop, and when you stop the reverse process is worse because the body goes through all kinds of changes. Nowadays I see young guys who haven&apos;t won any big titles only training for one contest a year. Why do you think that is? When I was competing we used to compete every month and I was ready to compete at any time. [ Q ] Then why are these people, as you put it, not competing more often? Because of the fact they depend on the steroids. The steroids can only be used for a certain amount of time and you can&apos;t stay on them for a long time. So you have to give your body a chance to recuperate and get back to normal. And everything goes away within weeks. I have seen guys on steroids go off them and four or five weeks later I can&apos;t believe they are the same person. So what do they do? They give the body a rest and then come back next year and try again and you get to a point where you can&apos;t stop so either you stop competing or you stop taking the drugs (laughs). Isn&apos;t that ridiculous. And I&apos;m going to tell you what is worse. The worst part of it is these guys do it alone. They don&apos;t go to a doctor to be checked out. I was petrified of taking whatever little bit I tried that time. But I went to a doctor and he did a big examination on me to make sure my body was not responding in a negative way to these drugs. And then he told me there only so much I could take. I personally believe that all these drugs and all these steroids probably have a benefit on your body at some point in your life, but not on a healthy person. [ Q ] As a form of hormone replacement in one&apos;s later years some steroids are thought to be effective though. Yes. I believe that as man gets older his testosterone level goes down. I go every year for a physical. And when I went for the physical I said to my doctor, "I want you to check my testosterone level." So he did and he said my testosterone level was normal at age 64. This is because I haven&apos;t abused my body. See when you start taking testosterone at an early age and you are doing it on your own, you are going to have problems later on. The body becomes confused because it stops producing its own testosterone because of the artificial testosterone you are taking. So when you get off, you have to get back on. The body is like a machine. If you put something that is not supposed to be there it is going to shut down. [ Q ] We all know that testosterone is an important hormone for all men. What are some of the best ways a male can increase their testosterone levels naturally? You have to begin to take care of yourself early in your life. You can&apos;t abuse your body and then all of a sudden want to reverse everything. We do a lot of damage to our bodies when we are young. So I tell people that they need to begin to take care of themselves now! Now! We need to teach this generation that they are moving too fast. It is not a fast lane that we are running in. Nowadays everything is fast. But I believe that if you take care of yourself at an early age it is like putting money in the bank and not taking it out. It (the body) is going to grow and stay strong that way. [ Q ] Let&apos;s say a man reaches the age of 50 and finds his blood testosterone is at low levels. What can he do to boost these levels back up sufficiently? I still think you should continue to train. You don&apos;t have to exercise as a competitive bodybuilder. But you can still train yourself. I still workout in the gym and there are not too many young guys who can keep up with me. I have two sons: one is in the Air Force and the other lives in Chicago. Now when they come to workout with me they can&apos;t keep up with me. Why? Because they exercise but they don&apos;t do it the way I have done it; they are not consistent. And that&apos;s how it is. [ Q ] Can supplementation also be important at your age? Yes, they go hand in hand (exercise and supplementation). Also at my age I do stretching exercises. Every morning I do five or ten minutes of stretching exercises and that gets me ready for the day. I believe that as we get older we need to practice stretching like Yoga — these types of movements. I have about six or seven movements that I do every morning and this keeps my muscles flexible. But if you sit back and do nothing after working out for so many years, you begin to get stiff and you begin to get arthritis and all these kinds of things. [ Q ] What is your basic daily routine these days? I usually get up between 7:00 and 7:30am. I&apos;m not a late sleeper. I have always done well with six hours, eight hours tops. And when I get up in the morning the first thing I do — every day — before I brush my teeth and get cleaned up is to do my stretching movements immediately. I have always been concerned about getting arthritis and not being flexible. And the other thing is I believe in keeping a good diet. I still take my multivitamins and a protein supplement also. [ Q ] How many grams of protein do you get each day? I have never counted calories or grams of protein. I really don&apos;t count it but I make sure I have enough quality protein. [ Q ] You have received a number of commendations over the years including a Steve Speyrer Classic Anatomy Hall of Fame award in 2005. Yes this was for my accomplishments in bodybuilding. I feel honored to be selected among all those big names and I never felt for one day that I would be selected for something like that. I feel honored. [ Q ] What makes this award extra special? It has shown me that my influence has not been in vain and that people do appreciate my accomplishments. And that is important to me; that people appreciate what I have done. That people still consider me part of bodybuilding history. [ Q ] You were also presented with a WBBG Hall of Fame award in 2007. How did it feel to be inducted along with many other big bodybuilding names? I tell you, the guys that were there I hadn&apos;t seen for so many years and we all have changed in one way or another. I was just happy to see them all again. To be counted among all the big guys was just a treat. 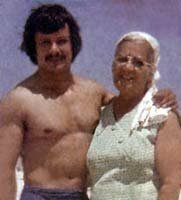 [ Q ] I read that Steve Reeves once said your physique was an inspiration to him. That is a pretty hefty commendation. When I heard that Steve Reeves considered me one of his favorite bodybuilders I was like, "Really? Steve Reeves, one of my heroes?" And I met him one time at a dinner in New York City and he told me himself. He said, "You know I really admire your physique." I said, "Wow, yes." We took some pictures together and after I had the picture developed he signed it and wrote something really nice on there. So I have that up on my wall. To me that was really exciting because I could not believe that "little old me" would be admired by Steve Reeves. It was an honor for me to hear that and he is a great gentleman. Anibal With Legendary Steve Reeves. [ Q ] What did Steve Reeves say about your physique? What did he like in particular? He liked the balance he saw in me. He said I had a very symmetrical physique and that I had not just a bodybuilding body, but also a body that people in general would like to look at. John Grimek used to tell me that too. 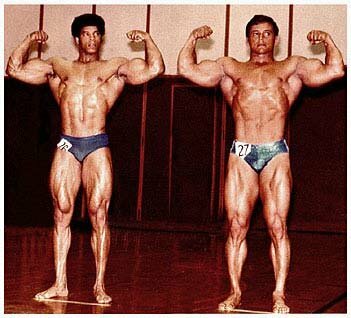 [ Q ] What was it like to be a bodybuilder back when you were in your prime in he &apos;70s? Bodybuilding then was fun. Bodybuilding now is a disaster. I&apos;m not a competitive bodybuilder nowadays so I don&apos;t have to compete with these guys. These guys are once a year bodybuilders and that is why we don&apos;t see them around much after a contest. But bodybuilding back then used to be fun; we used to have a great time. The competitors would get together and have a good time after the contest. If you lost you lost, if you won you won and everybody congratulated everybody. And then after a while it became ridiculous and that is one of the main reasons I walked away from it. Bodybuilders now want everything easy. Bodybuilders nowadays think they are the best. They need to learn one thing: you cannot see yourself as others see you. I always used to have Chris Dickerson look at me before a contest and we would go through the poses. And he would tell me which ones worked best for me. He would say: "No don&apos;t do that pose; you don&apos;t look good in that pose," even if I liked the pose. But I listened to him. Why? Because I couldn&apos;t see myself the way he saw me. But bodybuilders nowadays aren&apos;t asking anybody for help because they think they know it all. All they do is read the magazines and believe everything that is in the magazines. It is not good; you just can&apos;t do it like that. When you are in a sport, especially when you are beginning, you have to make it fun. You have to get some enjoyment out of it. I know I did. That is what we were talking about the other day when we were all here (at Anibal&apos;s birthday party). Ellington Darden was here as was Chris Dickerson. We were talking about how much fun it was and that nowadays you can&apos;t even talk to these guys. Very seldom will you find someone that is pleasant or who will go out of their way to help somebody else. I see it in the gym all the time. [ Q ] You have a lot of competitors out there aiming for the same contracts and it is thought that when money is involved things can change. You have to understand that when I was coming up there was no such thing as getting paid. You got a trophy and you went home. That was it and that is what made the difference. The money is good and all but still there is more to it. 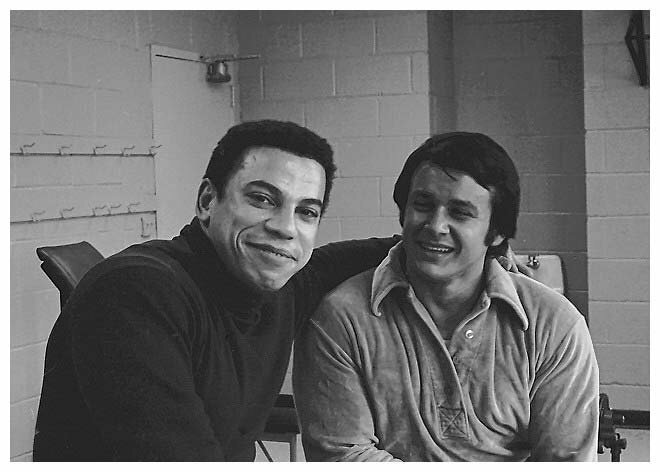 You know I could tell you how many times Chris and I used to travel with this guy who was a coach, Morris Weissbrot, an Olympic lifting coach, and he used to call me and Chris to go with him to do exhibitions for summer camps and we used to go to schools and prisons: all over. And we didn&apos;t get paid a penny. We had to pay our own expenses. We got a meal and we were happy. Sometimes we would spend the whole weekend on the road going from one place to the next just to give these kids an exhibition and they loved it. And that&apos;s the difference. You don&apos;t see that anymore. Nowadays everybody is just out for what they can get for themselves. I think it is a shame because it is not supposed to be like that. Morris Weissbrot founded the Lost Battalion Hall Weightlifting Team back in 1962, and was instrumental in keeping the team and the Olympic weightlifting facility alive. 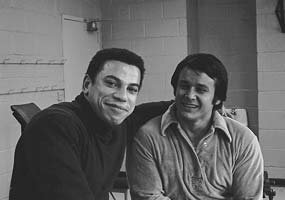 He coached many great lifters in the New York City area and orchestrated Olympic lifting contests and events throughout the region. 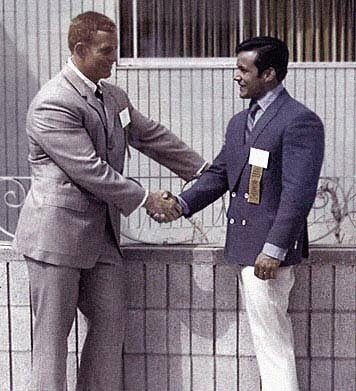 Morris traveled extensively to promote Olympic lifting in the USA and to support his lifters. He had an outgoing personality and a heart of gold. Anyone who lifts Olympic-style in New York City owes a debt of gratitude to Morris. [ Q ] What are some suggestions you would have for improving bodybuilding then? We need people who can raise the sport who really want to make difference. How? By going out of their way and getting off their ego trip and going out there and showing the kids that bodybuilding is good, that bodybuilding can be a great sport. And that bodybuilding is good for your health. But we don&apos;t have that. Right now, you ask any one of these guys to go anywhere and the first think they are going to ask you is how much money are they going to get paid. When people found out I was living here in Florida the people from Stanford University called me one time and the coach there said, "Look, we have some underprivileged people here and they would love to hear you speak." They had told them about me. I said, "Fine that would be no problem." I went over there. I also went to a high school over here and talked to them. I didn&apos;t tell them that they had to pay me so much. If you invite me to make an appearance in a bodybuilding show where you are charging a fee then yes I expect to get paid. But in saying that I think we as bodybuilders need to get out there and give something to these young kids. But you have to have a good image. You have to have an image where people will say, "You know, I want to be a bodybuilder like that guy." You don&apos;t want to go there all full of steroids because it turns people off. People say, "Is that what I have to do to look like that?" that is not a good image. [ Q ] What are some of the life lessons bodybuilding has taught you over the years? All the things I have done have taught me to look at people differently. When I look at somebody who comes to me for advice I cannot expect them to duplicate what I have done. I need to be more sensitive. I have to think about how I can help this person? What is this person looking for? When I find out what this person is looking for then I concentrate on that. I&apos;m maybe more sensitive and more realistic with people. [ Q ] Personal lessons? I believe that if a person can succeed in bodybuilding they can succeed in anything they want to. This is something that you have to do yourself; it is something that you cannot depend on somebody else to do for you. It is not like a baseball or football team where you have other people assisting you. I think just about every man tries to exercise with weights. But not too many stick with it. I think that if you ask any man out there, "Have you ever exercised?" and they will tell you, "yeah." If you are able to have that kind of mind, that kind of concentration and dedication to develop your body and all you are going to get is a trophy out of it, you can do whatever you want if you set your mind to doing it. It gives you that drive. I tell people nowadays in my spiritual life I apply the drive I had to become a bodybuilder to this life. If I want to have a relationship with God and I want to know him better I have to apply myself meaning that I have to look to know him, that I have to spend time with him and study his word. The same drive and dedication it takes to succeed in bodybuilding. Whatever it is that is put in my hands to do I use that drive. [ Q ] In other words you are consistent in what you do? Yes absolutely, to be at your best you have to be consistent with anything you do. Darden, E.(1982). The Nautilus Bodybuilding Book. Contemporary Books: Chicago.